After some time spent testing and filming it's finally here! Sorry for the strange photos, it's not easy to capture the multiple angles of this mess It's not a clean cage for sure, having to add external audio, a follow focus, a monitor and dealing with the already big profile of the Canon 5D makes it a heavy rig. Not that much weight wise but visually, especially since it is built for documentaries. But still I like it very much! - Adding the Tascam behind made the weight more balanced, the unit is exposed but there wasn't any space left on top. - The camera is well protected on all sides, which is for me very important since I already had a camera drop, small mistake that luckly didn't have any consequences, and there's always a chance of bumping. - The top handle already included on the neewer cage does his job well. 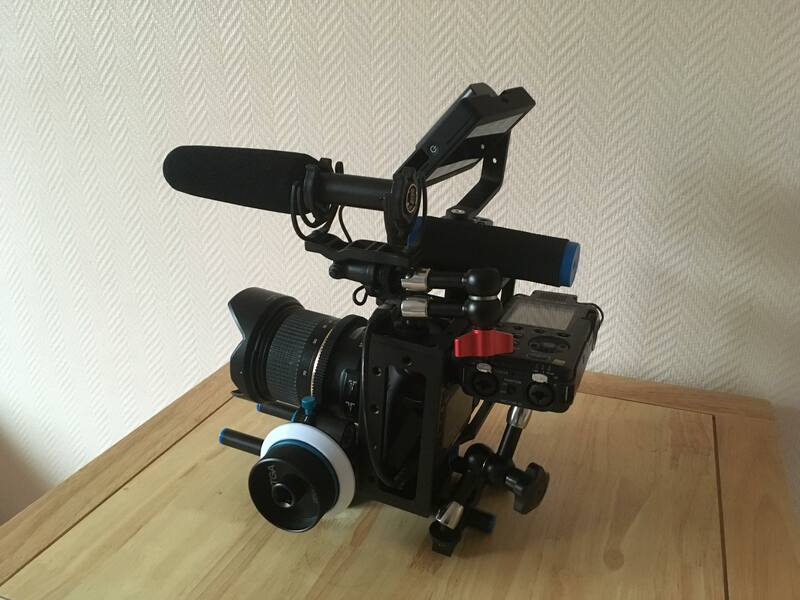 The right one from smallrig is sadly more expensive but still very usefull for me, when at eyes level I keep the right hand on it and the left under the cage near the follow focus. - The smallhd focus is a must for any rig I'd say, or another good monitor. You can't truly compose without it in a documentary setup. I didn't measure the weight yet, but it should be around 4 kg. I want to do something like this for my 7D and later invest in a 5D mk iii for full frame or maybe even 5d mk iv when Magic Lantern starts working on it. I don't need to mount an audio recorder for mine at least, but I would like an external monitor with an external battery pack for INFINITE (not really) battery life. What monitor did you use? If you are on a budget, have a look at a Feelworld T7. 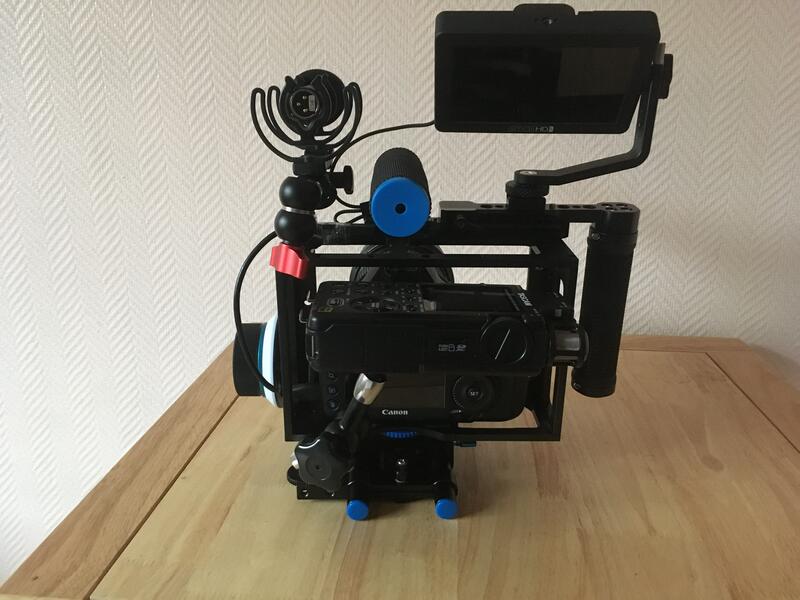 SmallHD Focus for the monitor, Neewer the cage, smallrig and camvate the magic arms. Wow this is a gorgeous resource! Thank you! I'm now reconsidering on how I'm going to build my camera rig from now on, wow! Is it comfortable to shoot handheld instead of a shoulder rig? Yes it is indeed a very good resource!! His instagram is plenty of configurations. Mmm I'd say it is a different level of comfort and kind of image. First of all building a good shoulder rig is more expensive. A good handheld rig can be extremelly comfortable and light weight, just try to grab a EOS CXXX. Perfectly balancing a DSLR is not that easy, it is easier with a smaller body like sony than a 5D, my rig is not perfect but still recently I've managed to shoot a sequence while also pulling focus and moving between the action, it came out quite good. A shoulder rig is bigger and more difficult to carry around, it is also less versatile, at the same time the kind of images and movements that it produces are immediatelly cinematographic. I'd say start with an inexpensive cage and build a shoulder rig if you really need it.